In business development, it’s all about the “value exchange” because the best learning comes from reciprocal relationships. So to help break through the inertia that may exist in organizations, you have to understand that BD involves so much more than this perception of sales to help drive a business forward. John Keeling, SVP of Business Development at The Motley Fool, joins us for this episode. John has had a unique career journey – he’s been an academic, started a web development company, held product management leadership roles, and all before being a business development executive. One of the biggest challenges facing business development is that it’s often siloed away from other business functions, and then narrowly defined and perceived as a sales role. If BD operates in a silo, then you're just increasing the risk and even making it likely that your business is going to end up misaligned. This is because creating silos in any organization leads to more distrust, a lack of transparency, and territorial behaviors. This narrow role of value is when you're thinking about what's in it for me – a zero-sum game with one winner and one loser – but we should always be looking for the win-win, or how can we invest in each other so that everyone is more successful. John has helped create an organization where BD is part of a crucial value exchange to help drive the business forward, rather than simply a sales function. This involves helping the organization develop a test-and-learn approach for getting information fast in order to determine how and what to invest in, finding novel approaches to old problems, identifying new opportunities, and ultimately, driving alignment within the organization. It’s the shift from a top-of-funnel function to a true strategic business partner. Taking a transactional view can trap you in a mindset where you're focusing on what you can get out of it and how you view your goals. An equal exchange breaks through barriers that get in the way of developing successful partnerships; it allows for working collaboratively so that you are then creating value together. 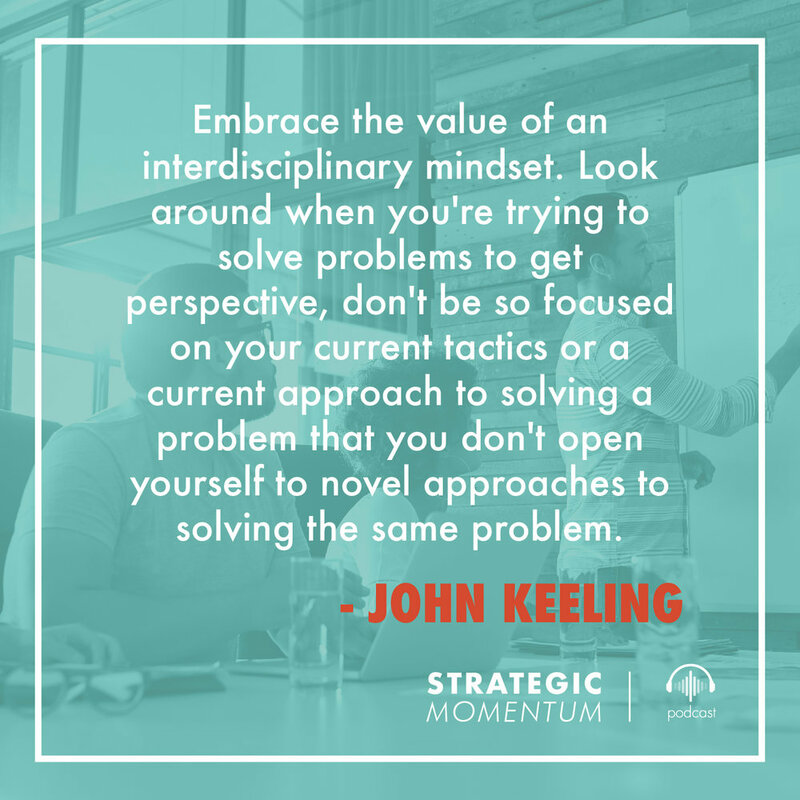 Look for those fresh new perspectives to help you solve a problem by embracing the value of an interdisciplinary mindset. These novel approaches can truly come from anywhere. Shared problem identification. Is everybody working to solve the same problem and is there agreement on that? Shared opportunity assessment. As opportunities come down the pike, we don't just see the opportunity but we've evaluated it, we understand what the potential outcomes are from investing in it, everybody's in agreement on that, and we understand what it takes to invest in that opportunity. Shared strategy for dealing with those obstacles. Have a clear understanding of the investment that both sides are attempting to make, their goals for those investments, and then ultimately support each other by investing in one another, you’ll be more successful collectively. You'll increase the probability of your success and you'll be successful, potentially, beyond your original objectives, if you can emphasize the value exchange in your approach.